You are invited to the Queer Alum Conference! 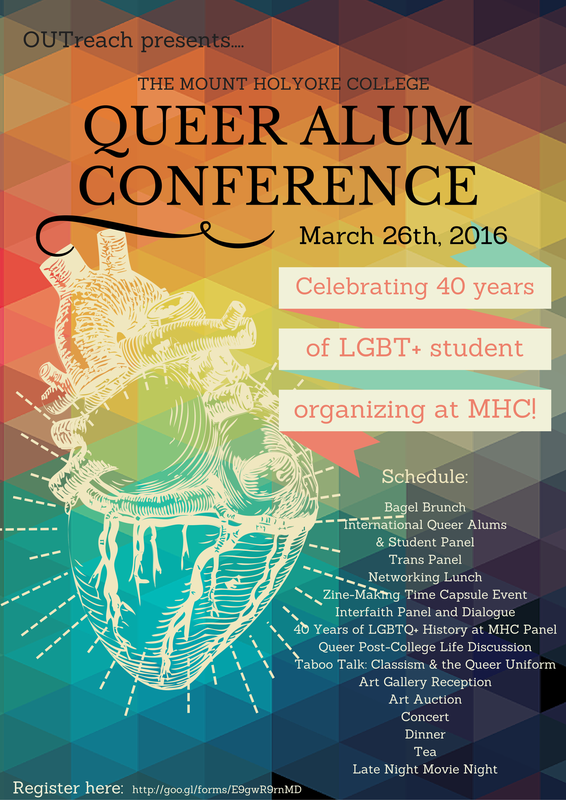 The Queer Alum Conference is being held to celebrate the 40th anniversary of LGBTQ+ organizations at Mount Holyoke College. The conference will take place on Saturday, March 26, 2016. Through a variety of panel discussion on a range of topics such as the history of queer activism and the experiences of trans individuals on campus, an art and photography exhibit and silent auction, zine workshops, networking, and more, we hope to promote intergenerational dialogue between past and current students about queer identities and activism on campus. Sponsored by Lyon's Pride and OUTreach (the umbrella queer organization on campus), we also hope to help forge connections between LGBTQ+ alums and current Mount Holyoke students. You can register for the conference using this link. Registration for the conference is free. Lyon's Pride member Bessy Reyna '70 was invited to speak at Hartford's Gay Pride Rally this year. This is a transcript of the talk she presented at the rally on June 26 at the Old State House. Transcribe the Woolley/Marks letters for the Mount Holyoke Archives! Rights: The Liz McMullen Show Publications requires the right to publish the original story in the above-mentioned anthology, in print, digital and audible forms, exclusively for one year after publication (exceptions made for "year's best" anthologies) and non-exclusively thereafter. The author retains copyright. In keeping with our theme of lesbians throughout history, a portion of the proceeds will be donated to a charity that assists senior lesbians. The chosen charities are: SAGE (Services & Advocacy for GLBT Elders) and GLARP (http://gaylesbianretiring.org/site/). Simmons College, comprised of an undergraduate women's college and several graduate schools, sent out a notice to its alums today with this link that formalizes its admissions policy for transgender applicants to its undergraduate program. In a tweet to me earlier today, they said that it was a policy that has already been in place for some time, but that they wanted to put it in writing now. All applicants to the undergraduate program who were assigned female at birth and/or applicants who self-identify as women are eligible to apply for admission. Simmons does not require government issued documentation for purposes of identifying an applicant's gender identity. Once enrolled, any student who completes the College's baccalaureate requirements will be awarded a Simmons degree regardless of gender identity or expression. Wonder Woman created by polyamorous household including Mount Holyoke alum! How about that ... a queer poly parentage to Wonder Woman! This book looks fascinating.